A Russian military aircraft went off radar near Hmeymim Airbase on Monday, which coincided with Israeli strikes on Syrian targets in Latakia. On Tuesday, the Russian MoD stated that the plane was downed by Syrian air defenses after Israeli jets used it as cover. In light of the revelations, Sputnik has rounded up the key details about the incident. On Monday evening, Syrian media reported missile strikes on the province of Latakia, with some rockets hitting parts of the city, while many projectiles were successfully intercepted by Syrian air defenses. "Syria's air defense systems have responded to an air attack in Latakia. Most likely there were drones and missiles involved," a source told Sputnik, while another source from the Syrian military suggested that the attack was perpetrated from the sea. Reacting to the reports, the Russian military stated that airspace control radar systems had detected missile launches from the French frigate Auvergne in the Mediterranean. Later on Tuesday, French military Colonel Patrik Steiger said that Paris denied "any involvement in the incident." Shortly afterwards, the Russian Ministry of Defense reported that the Russian Il-20 aircraft vanished from radar near Hmeymim Airbase in Syria with 15 servicemen on board. Addressing the missing plane, the ministry stated that it had identified four Israeli F-16 jets carrying out airstrikes on targets in Latakia. An Israeli Defense Forces spokesman, however, refused to comment on the foreign reports. During a presser earlier in the day, Russian Defense Ministry spokesman Maj. Gen. Igor Konashenkov stated that the Russian aircraft was indeed downed by Syrian air defenses after Israeli F-16s used it as a shield. "Using the Russian plane as a shield, the Israeli pilots put it in the fire of Syrian air defense systems… the Il-20… was hit by the S-200 system's missile," Konashenkov stated. — Russia in RSA 🇷🇺 (@EmbassyofRussia) 18 сентября 2018 г.
Stressing that the search-and-rescue operation near the crash site was underway, Konashenkov said 15 Russian servicemen had died as a result of the "irresponsible actions" of the IDF, which violated "the spirit of the Israeli-Russian partnership." “Eight ships, including Russian Naval cutters and supply vessels, are participating in the operation to locate the crew of the Russian Il-20 aircraft which crashed off the coast of Latakia," the ministry said. He further branded “these provocative actions” by Israel as “hostile,” adding that the MoD reserved the right to an “adequate” response. Shortly after, the ministry announced that as a result of the search mission, the bodies of the crew had been located and pulled up on board the ships. In light of the Russian MoD's statements, the Syrian army has not provided any comments so far. Meanwhile, the IDF broke its silence via Twitter to address the incident, which it blamed on Syrian forces, and promised to share “all the relevant information with the Russian government.” At the same time, Israel appeared to have recognized that it had struck military infrastructure in Latakia. Israel expresses sorrow for the death of the aircrew members of the Russian plane that was downed tonight due to Syrian anti-aircraft fire. Israel holds the Assad regime, whose military shot down the Russian plane, fully responsible for this incident. — Israel Defense Forces (@IDFSpokesperson) 18 сентября 2018 г.
Israel also holds Iran and the Hezbollah terror organization accountable for this unfortunate incident. Overnight, IDF fighter jets targeted a facility of the Syrian Armed Forces from which systems to manufacture accurate and lethal weapons were about to be transferred on behalf of Iran to Hezbollah in Lebanon. These weapons were meant to attack Israel, and posed an intolerable threat against it. The IDF and the Russian army have a deconfliction system, which was agreed upon by the states' leaders, and has proven itself many times over recent years. This system was in use tonight as well. 1. Extensive and inaccurate Syrian anti-aircraft (Surface to Air missile) fire caused the Russian plane to be hit and downed. 2. When the Syrian Army launched the missiles that hit the Russian plane, IAF jets were already within Israeli airspace. 3. During the strike against the target in Latakia, the Russian plane that was then hit was not within the area of the operation. 4. The Syrian anti-air batteries fired indiscriminately and from what we understand, did not bother to ensure that no Russian planes were in the air. Israel will share all the relevant information with the Russian Government to review the incident and to confirm the facts in this inquiry. During a press conference with Hungarian Prime Minister Victor Orban later on Tuesday, Russian President Vladimir Putin said that Israel didn't down the Russian plane; it was a “chain of tragic accidental circumstances” that led to the crash. "When people die, especially in such tragic circumstances, it is always a tragedy, a tragedy for us all, for the whole country and for the families of our dead friends. 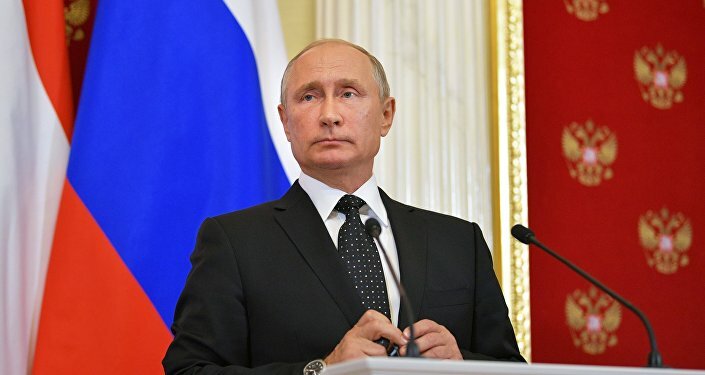 In this connection, I certainly offer my condolences to the relatives of those who were killed in the crash,” Putin said. "Most certainly, we have to sort the case out most seriously. And our attitude to the tragedy is outlined in the Russian Defense Ministry's statement," he stressed. The president promised to boost the security of Russian military personnel in Syria. "Russia's retaliatory measures with regard to the Il-20 downing will be directed primarily at stepping up security of Russian military officers in Syria, our military facilities in the Syrian Arab Republic. These will be the steps everyone will notice," he emphasized. According to Kremlin spokesman Dmitry Peskov, Putin will likely hold a phone conversation with Israeli Prime Minister Benjamin Netanyahu later in the day.